Health and Safety is becoming an ever more important thing to consider in the Australian manufacturing environment. An obvious solution to keep dangerous machinery and staff separated is industrial safety fencing, which we build here in Australia. There are a few things to consider when it comes to industrial safety fencing. 1) Does it comply with the Australian standard for industrial safety fencing? There are a few standards to consider. Most notably AS4024-1-1996 “Safeguarding of Machinery – General principles” and AS2939-1987 “Industrial Robot Systems – Safe design and usage”. All Robotunits safety fencing panels comply with this standard. However, the correct installation onsite is also to be considered. For example, if an individual safety fencing panel supplied by Robotunits complies with the standard but it is installed to close to the hazard area it could still be deemed none-compliant. The message there is that all industrial safety fencing needs to be build to the appropriate Australian Standard and must also be installed to the relevant Standard. Please call us if you have specific questions in this regard. 2) How easy it the onsite installation? All Robotunits industrial safety fence panels are pre built here in our Melbourne workshop. They are delivered in two parts. The first one being the actual safety fence panel, the second part is the bolt down foot. What this means for the installer is that the bolt down foot can be installed without having to deal with the often large and cumbersome fence panel. Once the foot is dynabolted to the ground our industrial safety fence panels slot securely into the foot. 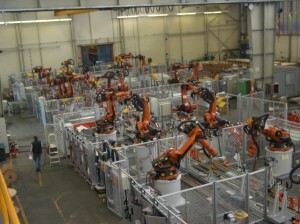 This means that one person can install a Robotunits industrial safety fence solution. This is often a very large cost saving and makes it another great reason to use Robotunits Safety Fence Panels. 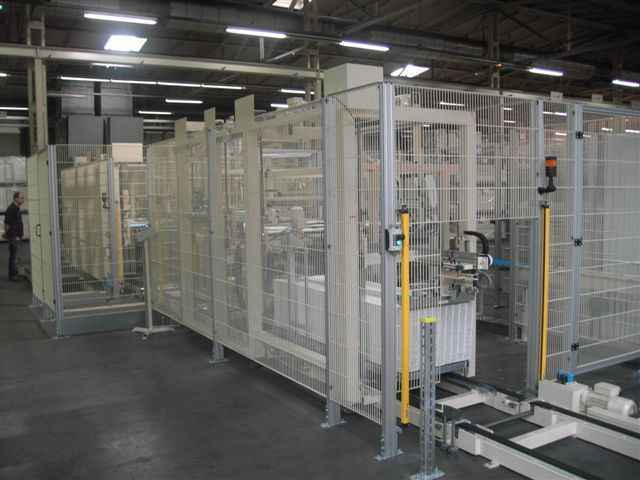 3) General Construction of Robotunits Industrial Safety Fence Panels. We have a standard range of safety fence panels. They are 2000mm high and come in a range of different standard width from 160mm width to 2000mm width. No additional pillars are needed between the individual panels. The standard infill is 40mm x 40mm woven mesh which is secured into our aluminium extrusions with a patented clip. The standard color of the industrial safety fence panels is silver. All posts are anodized aluminium and the mesh infill is galvanised steel. 4) Special Industrial Safety Fence Panels. Here at Robotunits we offer customised safety fence panels outside of the standard range we stock. We offer different color options. In Australia we get often asked to supply all posts in yellow and the mesh infill in black. A lot of people think these colors are a must to comply with the standard. This is not so but we can supply in those colors. Other customisations include different infill panels like polycarbonate or mild steel infill’s. We can also supply to different heights and width depending on your exact needs. Infeed tunnels and other considerations are also something we can help our customers with. 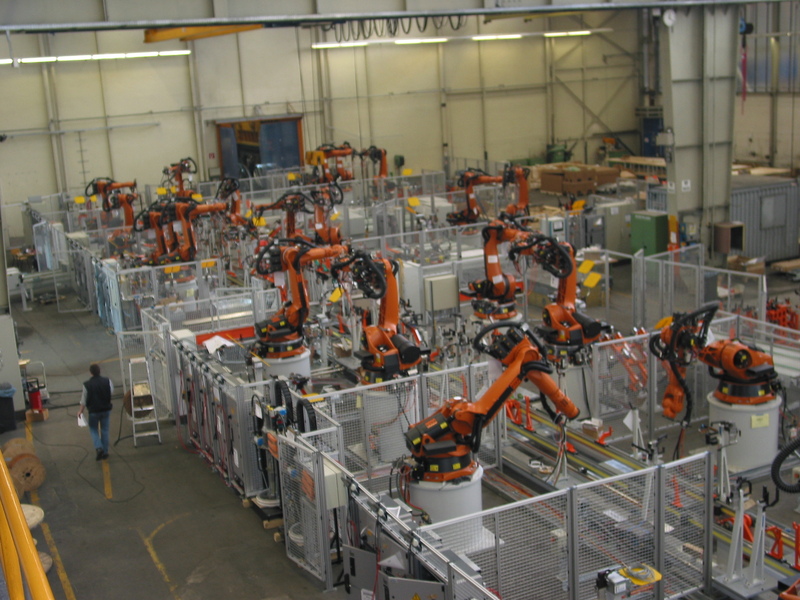 You can find more information on all Robotunits Industrial Safety Fencing Solutions here. So if you have a industrial safety fence application and need help with designing a compliant solution please contact us on 03 9334 5182. We are here to help you through this often tricky minefield of complying with all the relevant standards. We then design, build and supply a solution that is not only great looking but complies to all the relevant standards. Robotunits Industrial Safety Fencing safeguarding a large robot installation. New Safety Fencing comming soon! 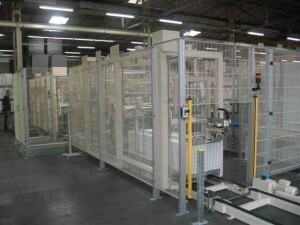 Robotunits Austria has developed a new safety fencing system which will be introduced to the Australian market sometime during 2011. There will be a number of changes compared to the current line of safety fencing. The main difference is the the change from galvanised woven mesh panels to welded powdercoated mesh panels. We will be releasing detailed information about the release of the new safety fencing line shortly. Big Discounts on current standard Safety Fencing! To clear current stock level and to make room for the arrival of the new mesh we are offering significant discounts on all current standard safety fence panels. They are the 516mm, 822mm, 997mm, 1522mm and 2003mm wide elements of the S4S and S8S line of fencing. This offer is available during February and March 2011 or until stock runs out. Be Quick!